A diamond's cut is the most critical of the 4Cs because it's what gives the diamond its brilliance, sparkle, and fire - the diamond's three main attributes. When people talk about "brilliance," they are referring to the amount of light a diamond reflects. "Fire" describes the way the light disperses and how the diamond shows off the different colors of the spectrum. "Sparkle" - also known as "scintillation" - defines how much the diamond shimmers when you move it around in the light. When light enters the diamond, it is refracted and bounces back out in a rainbow of colors. The way a diamond is cut will have the biggest effect on how the stone catches and interacts with light. It is the ultimate expression of a craftsman's skill in transforming a rough diamond into a breathtaking gem. If the diamond is too shallow and not cut right, some of the light will be lost out of the bottom. One that is cut too deeply will lose light out the side of its base. An Ideal Cut diamond will reflect most of the light through their table or top surface. The cut of a diamond refers not to its shape, but to the balance of proportion, symmetry and polish achieved by the diamond cutter. The extent of how well the diamond is cut is directly related to the diamond's overall beauty. When a diamond has been correctly cut, the diamond's ability to reflect and refract light is greatly enhanced. By understanding the way that light moves through diamond crystals, modern diamond cutters have established a specific set of proportions and angles that are known to harness the diamond's internal brilliance and to show it in its best light. Often confused with a diamond shape, the cut is actually the grading that determines how well the diamond sparkles. It encapsulates Brightness (white light reflecting from the top surface), Fire (flares of color) and Scintillation (flashes of light). Diamond Cut Interaction With Light. The cut grading currently only applies to Round diamonds as they are technically easier to measure in terms of light performance. Other shapes - such as Princess cuts, Cushions cuts, Emerald shapes, do not have a cut grading on their certificates. It is very hard to see the difference between an Excellent and a Very Good cut diamond as the direction of light is the same in both cut gradings. We therefore recommend you try to stick with an Excellent or Very Good cut, but if needed to fit the budget, a Good cut can offer an excellent value alternative without any major compromises. Just make sure you are not on the "Deep" side or you will end up with a diamond that looks smaller than the actual carat weight. Brilliance, or brightness, refers to the white light that is reflected back to the eye from the diamond. Light enters through the top of the diamond (the table), is broken down into a rainbow of spectral colors, and is reflected back and forth in the interior of the gem by bouncing off the mirror-like facets. Light exits through the table, recombining as white light. Dispersion is the rainbow of colors that is reflected back to the eye from the diamond. Light enters through the top of the diamond, is broken down into a rainbow of spectral colors, and is reflected back and forth in the interior of the gem by bouncing off the mirror-like facets. When it leaves through the crown, it stays separated and reaches the eye in flashes of color. Scintillation is the play of light you see with movement of the diamond, demonstrated by sparkling on the diamond's surface. A diamond is evaluated on its ability to reflect and refract light in all directions. The quality of cut is determined by how well the symmetry, polish, and proportions of the diamond produce the most attractive balance of the three different types of reflection. Several proportion factors have the most immediate impact on a diamond's ability to reflect light correctly. 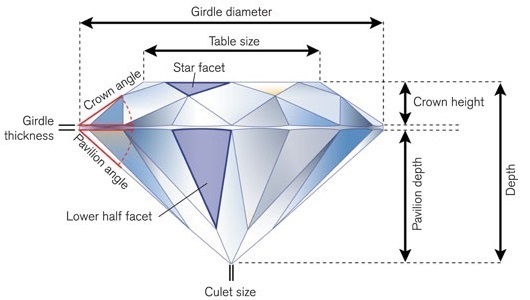 The table size and depth of a diamond relative to the diameter greatly impacts the light return from a diamond. A well-cut diamond is proportioned so that most of the light entering the gem exits back through the top of the stone, perfectly balancing the white light (brilliance) with intense flashes of fire (dispersion). A poorly-cut diamond, with facets cut only a few degrees out of alignment, can result in light exiting through the bottom of the diamond, known as light leakage, instead of from the top where it is visible. This creates a diamond with dulled brilliance from poor light performance within the gem, making the center of the gem look dark. GIA, considered to be one of the most respected laboratories for grading natural diamonds, uses the following language on their certificates to grade cut for round diamonds: Excellent, Very Good, Good, Fair, Poor. A GIA Excellent cut will be listed as either Ideal or Super Ideal with some reputable jeweller's. Excellent Excellent cut diamonds provide the highest level of fire and brilliance. Because almost all of the incoming light is reflected through the table, the diamond radiates with magnificent sparkle. Very Good Very Good cut diamonds offer exceptional brilliance and fire. A large majority of the entering light reflects through the diamond's table. To the naked eye, very good diamonds provide similar sparkle to those of Excellent grade. Good Good cut diamonds showcase brilliance and sparkle, with much of the light reflecting through the table to the viewer's eye. These diamonds provide beauty at a lower price point. Fair Fair cut diamonds offer little brilliance, as light easily exits through the bottom and sides of the diamond. Diamonds of a fair cut may be a satisfactory choice for smaller carats and those acting as side stones. Poor Poor cut ciamonds yield nearly no sparkle, brilliance or fire. Entering light escapes from the sides and bottom of the diamond. From the crown to the culet, get familiar with the anatomy of a diamond and with the measurements that play a key role in determining its cut. A diamond is made up of two key sections, the Crown and the Pavilion. Their structure and relationship to each other in the form of table and depth percentages have the biggest impact on the diamond's sparkle. The round brilliant cut has been used as an example, because with most other diamond shapes ("fancy cut" diamonds) the cut grading is more complicated (hence why their cut grading does not appear on certificates such as GIA). Diameter: Width of the diamond at the widest point of the girdle (in fancy cut diamonds, the smallest diameter is used). Table: The largest facet at the top. Crown: The top part of the diamond between the girdle and the table. Girdle: The narrow band at the diamond's widest point. Pavilion: The bottom part of the diamond between the girdle and the culet. Culet: The fact at the bottom tip (preferable when not visible to the naked eye). Depth: The height of a diamond from the table to the culet. The science behind a diamond's brilliance depends on its great ability to bend, slow and direct light as it passes through. The cut of a diamond determines how well the diamond is able to re-direct the light back through the surface of the diamond. Light travelling at about 186,000 miles per second, when passing through a diamond is reduced to about 77,000 miles per second, close to the maximum for any other transparent substance. Effects of Light on a Diamond. It's important to note that the cut depends on the stone's shape while it does not describe the shape. The most popular shape is the round brilliant diamond that is cut with 57 facets. When the culet is flattened into a facet, a round diamond will have 58 facets. Other shapes are usually referred to as "fancy shapes," and include princess, emerald, asscher, marquise, oval, radiant, pear, heart and cushion. Each diamond shape has its own set of guidelines that determine the quality level of its cut. Depth Percentage: The higher the number, the deeper the stone. The lower the number the shallower the stone. Table Percentage: The higher the number, the bigger the table looks. The lower the number, the smaller the table looks. Table and depth percentages affect how light travels within the diamond and impacts a stone's brilliance. If a cut is too shallow, light escapes out from the sides and the diamond loses brilliance. 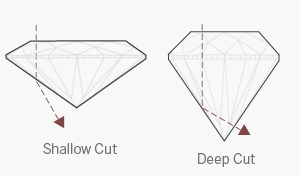 If the cut is too deep, light is lost from the bottom and the diamond appears dull or dark. Diamond Table and Depth Percentages. GIA have developed a grading system, which take these and other important factors into account to provide a scientific assessment of a diamond's sparkle. 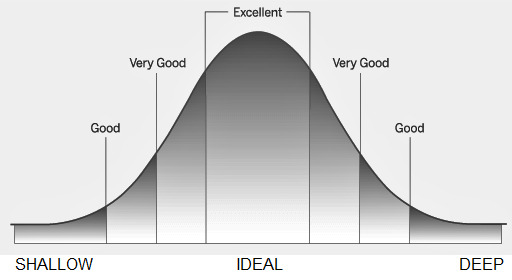 Most reputable jewellers use the GIA classification of Excellent, Very Good, Good, Fair and Poor grades to help customers assess diamond quality. The table below displays the GIA grading classifications relating to cut. Diamonds classified as Excellent or Ideal cut offer the mostsparkle, dispersion and fire and are considered to be of the highest quality. Light moving through an ideal cut diamond bounces almost fully back out the top of the stone and brings its brilliance into view. Diamonds classified as Very Good offer slightly less brilliance and scintillation than the excellent cut. However, as the difference between the two is almost indistinguishable to the unaided eye, very good cuts offer better value for money than excellent cut diamonds. Diamonds classified as "Good" usually allow some light to escape during the reflective process, although once again, the difference between this and the very good cut diamonds is small therefore good cuts offer great value for money and make for a more affordable option. Light moving through a shallow cut diamond is lost out of the bottom of the stone and the lack of light play makes shallow cut diamonds appear lifeless. Light moving through a deep cut diamond escapes out from the sides, darkening all or most portions of the stone. The poor sparkle performance of Diamonds classified as Fair or Poor cut may be noticeable to the untrained eye, and are for this reason also less costly. When the facets of a diamond are well balanced and aligned, the stone has symmetry, which is critical to creating optimal brilliance and scintillation. Errors in symmetry include facets that are not properly aligned, improperly shaped facets, or an off-centre table. The relationship between the crown and the pavilion angles has an effect on the appearance of a diamond. A diamond's pavilion angle and depth must be correct to capture and reflect light optimally. A slightly steep pavilion angle can be complemented by a shallower crown angle, and vice versa.In diamonds with extremely deep pavilions, the whole surface of the table appears to be darker creating what is known as a "nailhead". Gems with more shallow pavilions often produce a "fisheye" effect due to the girdle's reflection in the diamond's table. When exposed to ultraviolet light, a small percentage of diamonds fluoresce, or emit a blue or yellow light. Fluorescence is caused by trace elements, usually boron, that seep into the diamond when it is created. While fluorescence does not necessarily affect a diamond's value, it is listed on a diamond grading report. After a diamond is cut, each facet must be polished. The process can leave surface scratches or marks, which are like streaks left behind after a car is waxed. If a diamond has no scratches or very minor ones, the polish is of a high degree. Scratches, lines, burn markscreated by excessive heat, or rough girdles could downgrade the polish rating of a diamond and if significant, could affect the overall cut grading. The girdle is the outer edge of the diamond, where the crown (top) meets the pavilion (bottom). • The thickness of the girdle affects the relative position of the surrounding facets, and so can impact cut. Because girdle width is already factored into the diamond's overall cut grade, a diamond graded as well cut will produce superior brilliance, fire, and scintillation, even if the girdle itself is not in the ideal Thin-Slightly Thick range of width. • A thicker girdle will add weight to a diamond, thereby increasing its price. Since a thick girdle adds depth to a diamond but not width, a thick girdled diamond will not appear any larger when viewed from the top (e.g. when set in a piece of jewellery), despite the additional carat weight. The effect on carat weight and price is minimal, but real. • An Extremely Thin girdle is more susceptible to chipping, and for that reason should be avoided for diamonds that are to be set in a ring. Earrings or pendants are less exposed to rough contact and so are less susceptible to chipping around the girdle. Avoid both Extremely Thin and Very Thin girdles in princess cut diamonds, as this shape already has sharp corners more prone to chipping. If you do purchase a princess cut diamond with a Very Thin girdle, consider setting it in a style that covers and protects the corners. 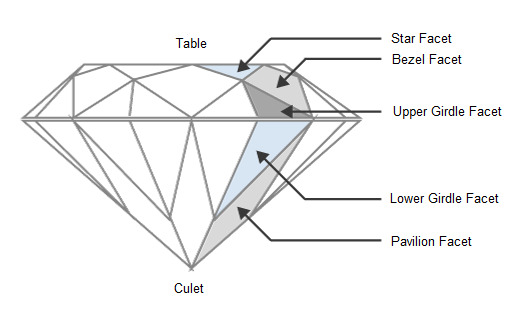 The culet (pronounced cue-let) is the small area at the bottom of a diamond's pavilion. The culet can be a point or a very small facet sitting parallel to the table. None, Very Small, Small, Medium, Slightly Large, Large, Very Large. Any diamond culet size of Medium or smaller will be invisible to the naked eye, and have no negative impact on a diamond's appearance. However, if a culet is Slightly Large or larger, it may allow light entering from the crown to pass straight through the culet facet, reducing the diamond's brilliance. This may also make the culet appear as an inclusion*, or create a dead area on the diamond where the light is escaping through the bottom. * An inclusion is an internal flaw in the diamond. The position, size, number, color, and reflectivity of a diamond's inclusions has a significant impact on its appearance and value. Clarity refers to the degree to which these natural flaws are present. Diamonds graded by the GIA and other labs have their clarity rated on a scale of F (flawless) to i3 (significant inclusions). During the 1980s in Japan, it was discovered that when a round brilliant diamond with exceptional symmetry was viewed from the bottom through a special viewer a pattern of hearts could be seen, and when viewed from the top showed eight gray arrowheads. Diamonds displaying such exceptional symmetry account for less than 1 % of all diamonds cut. The highest grades of polish, symmetry and perfect cutting angles allow it to reflect more light than a standard cut diamond. 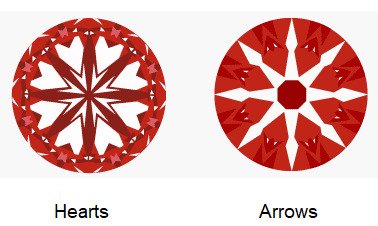 Following the discovery, a special viewer was developed to display the Hearts & Arrows effect. The viewer is useful in determining the optical symmetry of a diamond, through the internal movement of light and reflection, depending on the size, shape and arrangement of facets. This optical symmetry is different from the Symmetry Grading on a laboratory grading report that assesses the 'tidiness' of facet intersections and placement. Diamonds with Hearts and Arrows patterns became very popular in Japan and spread as a trend in the USA during the mid 1990s.